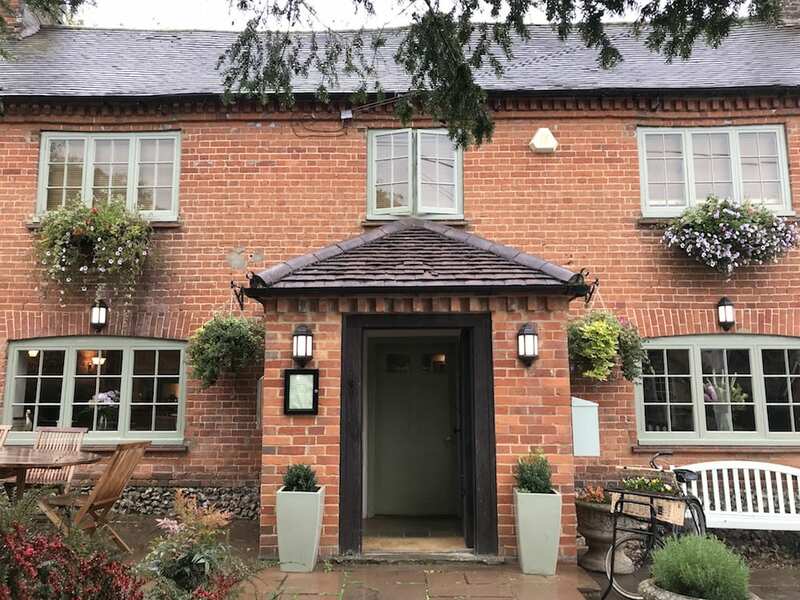 After 4 long years, this stylish gastropub high in the Chilterns re-opened at the end of last year. But was it worth the wait? High up in the Buckinghamshire Chilterns (an AONB of course), Frieth is so picturesque that both Chitty Chitty Bang Bang and Midsomer Murders have been filmed in the area. You can puff up the steep hill in Turville nearby to see the Chitty windmill (my kids love it) or go on a tour of the murders of Midsummer (also loved by my kids rather worryingly). 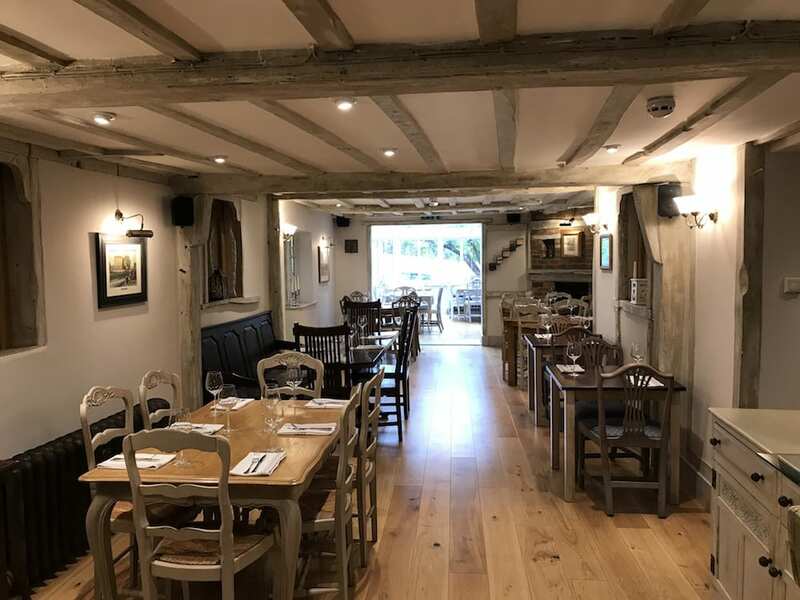 All good for building up an appetite or walking off that lunch (or dinner) at gastropub The Yew Tree, only open since last December after a four year hiatus. I won’t go into the tedious details, something to do with the council and planning, but the feisty Frieth residents rallied and fought for their pub. They have been rewarded with a rather special place that serves darn good food. The bar area has a large open fireplace (very welcoming in the winter) with several seats to park yourself just for a drink. 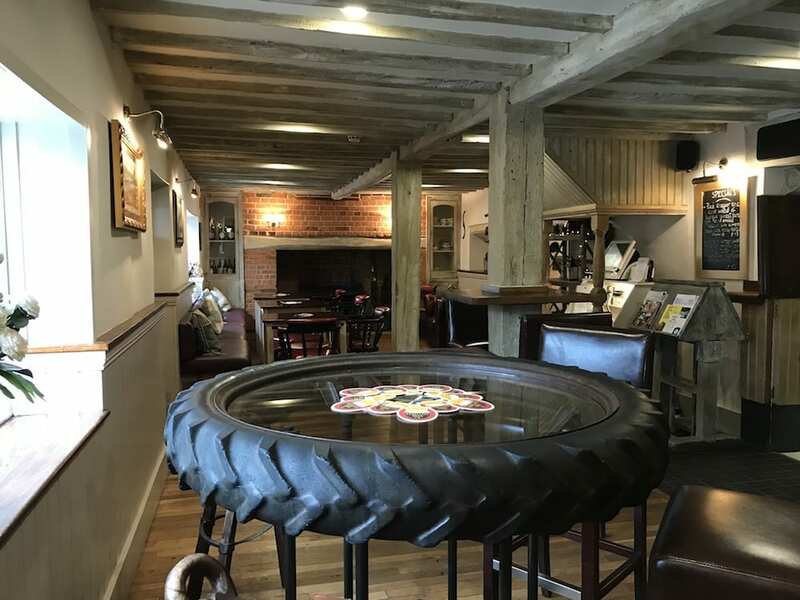 I rather liked this high table made from a tractor tyre, perhaps to remind you that you’re surrounded by fields given over to agriculture around these ‘ere parts. 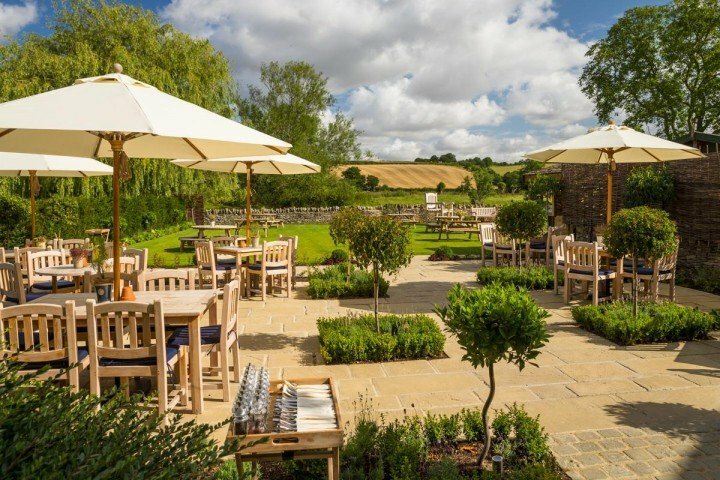 There’s also a decent lawned garden to the side of the pub for alfresco drinking. 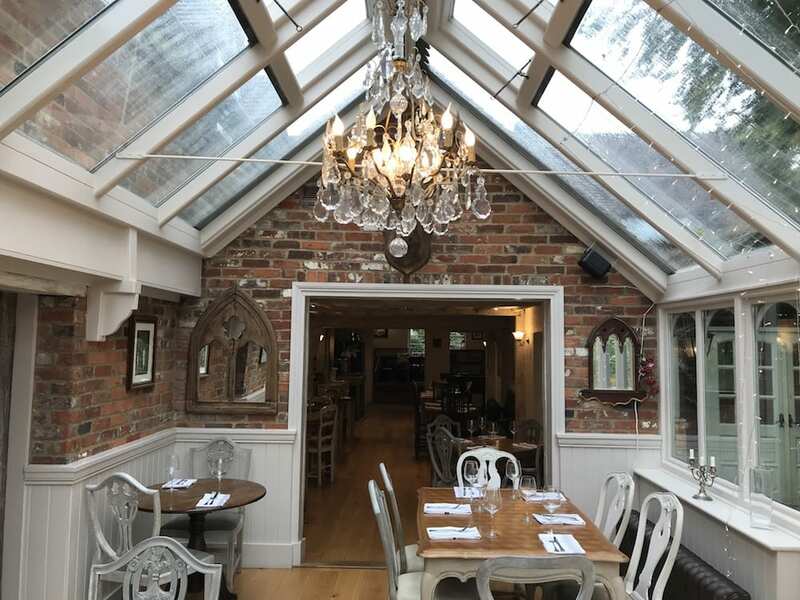 But my impression is that the food is what the Yew Tree is all about, with its long shabby chic styled dining area that flows on through to a pretty conservatory. 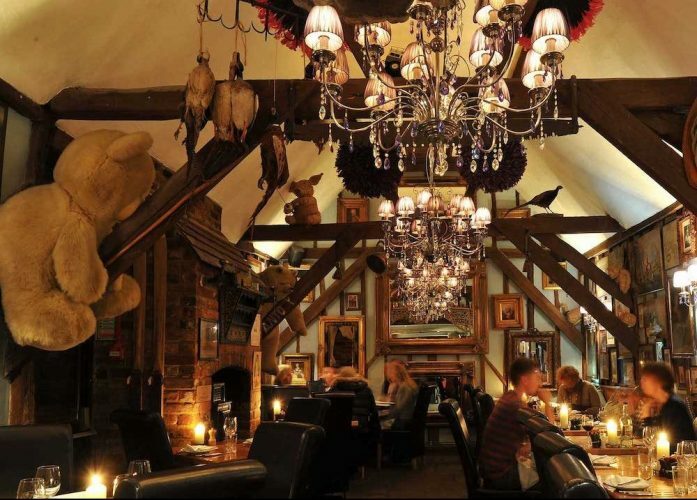 The large chandelier below is actually concealing a stag’s head which gave a certain quirkiness, but all in all, the decor is neutral and rustically charming – lots of wood and muted colours and wooden beams – and creates a relaxed vibe. We went for Saturday lunch and the place wasn’t heaving but there were enough people to give it a buzz. 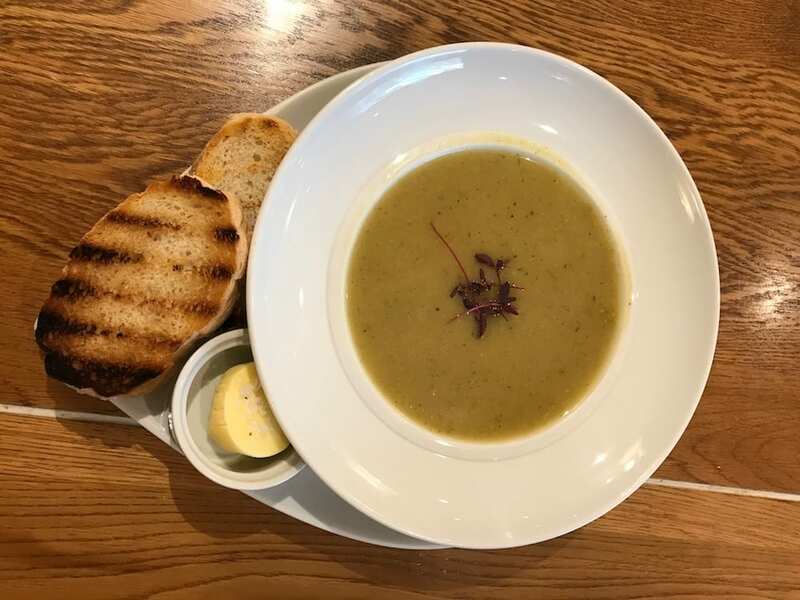 Like most pubs, evenings and Sunday lunches are their busiest but they’ve been sensible in not opening on Mondays and Tuesdays when they know business is slow. By Wednesday the weekend is in sight so totes fine to be down the pub. 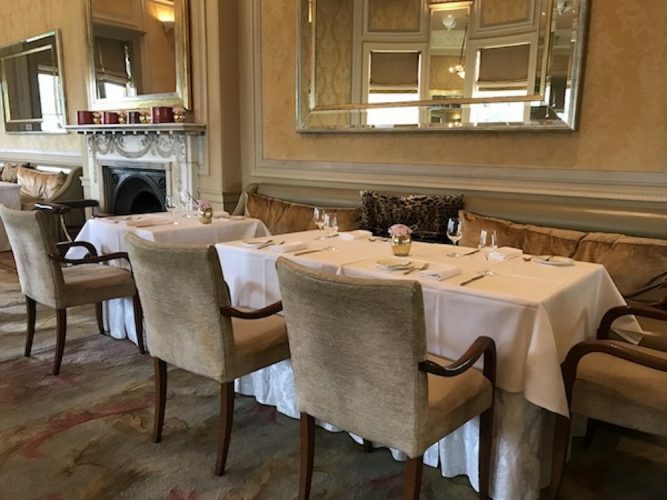 Service was attentive and friendly and the menu tempting and not too long – as Gordon Ramsey himself banged on about in his Kitchen Nightmares, better to do fewer dishes well than offer a list as long as your arm. There’s a good selection of local ales and plenty of wines by the glass to choose from too. Starters or small plates included tempura squid, pan seared scallops and duck parfait (all around the £6 mark) but the hubster started with the market soup of the day (parsnip and asparagus) and I had griddled halloumi with chipotle mayo, peppers and dry slaw. Both ticked the box for superior pub food fare. 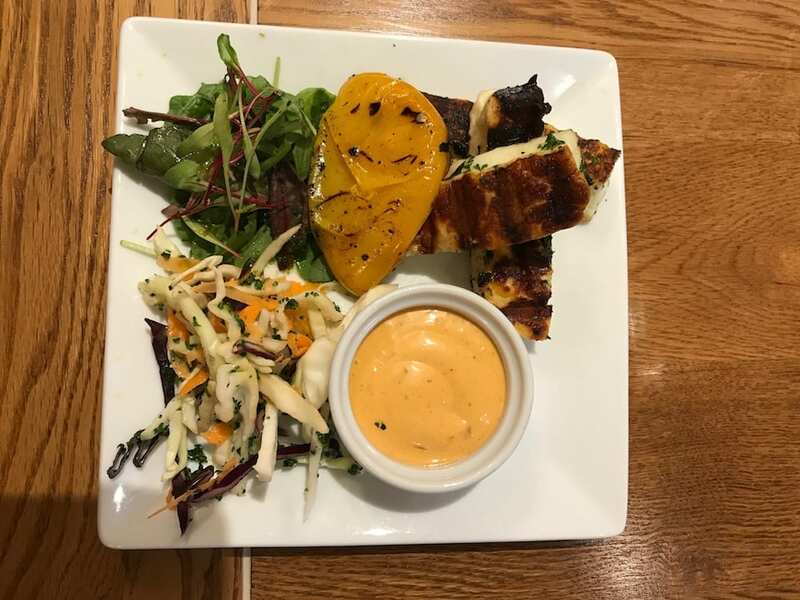 The soup tasted fresh and wholesome, the halloumi was crunchy on the top and the chipotle mayo gave it a great kick. Moving on to mains, we decided on the red snapper special and the pork belly, but we could have gone for mussels, sea bass, tofu with noodles, catch of the day, 28 day aged steak, chicken or lamb. The meat is cooked on a Parrilla Charcoal Grill which gave it a subtle smokiness. 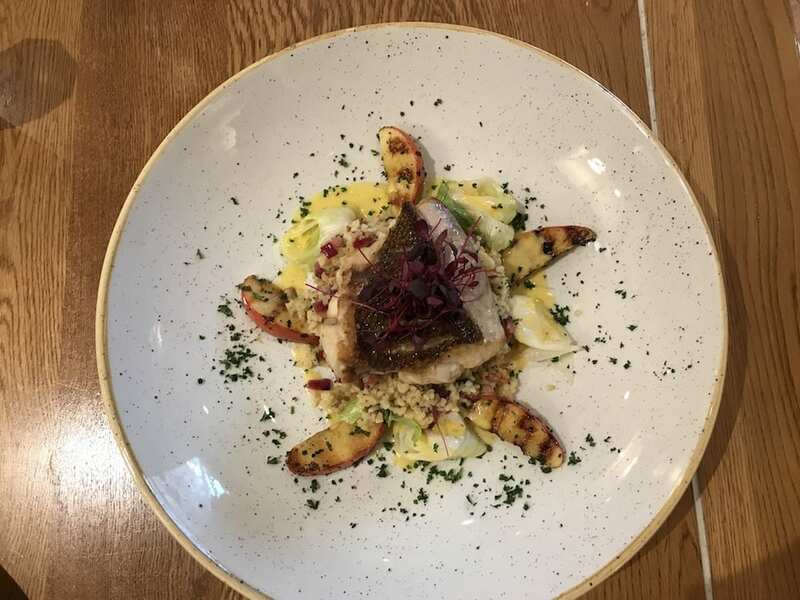 My husband’s red snapper was lifted by fabulous autumn flavours like apple and bulgar wheat. 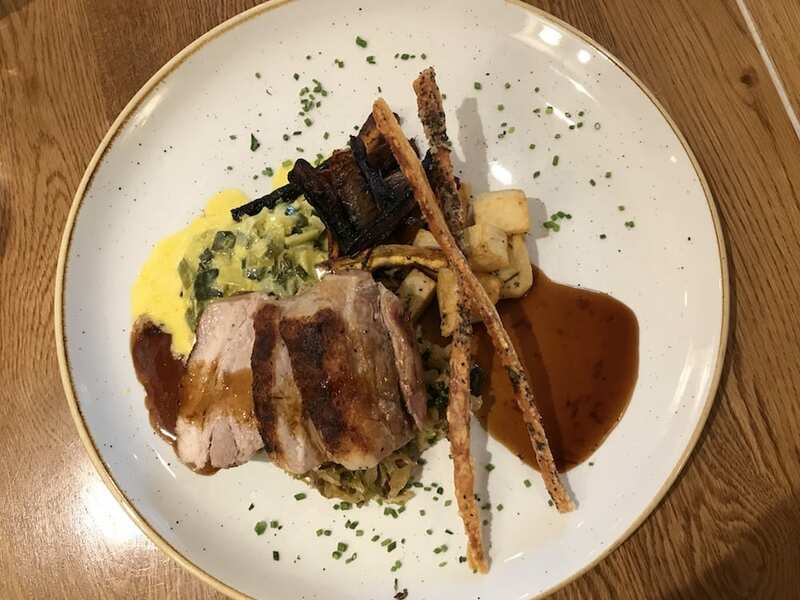 My pork belly was melt in the mouth with divine crackling, mustard leeks, parmentier potatoes and a beautifully glossy gravy. All well presented on large plates with decent portions, but not so huge to fill the plate and overwhelm you. 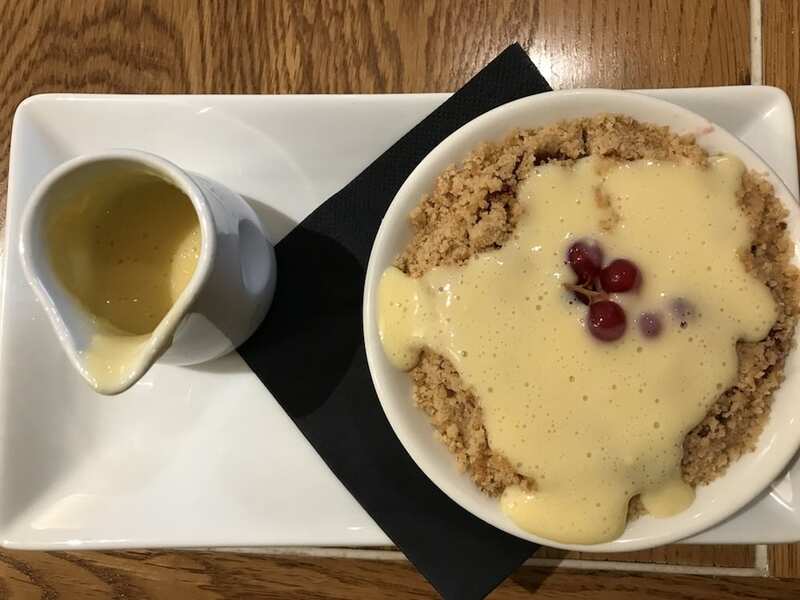 I was now too full for my go-tos of sticky toffee pudding, double choc fudge cake or burnt lemon creme brûlée (all at £6.50) but my other half had apple and blackberry crumble with proper custard – excellent as it happens (I snaffled a taste) with plenty of fruit and crunchy topping and a pretty touch of redcurrants on top. Since you’re in the Chilterns, there are lots of great walks with woodland trails and fields a plenty to march off that lunch. Stonor Park is only 20 mins by car where you can explore the historic house dating back to the 12th century, the beautiful landscape gardens and the Wonder Woods Adventure playground. 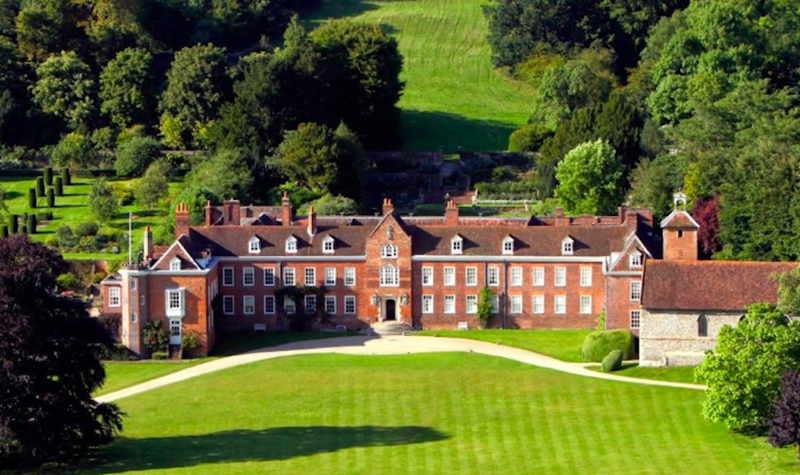 Hughenden Manor and Greys Court are two nearby National Trust estates that I love. And the towns of Marlow and Henley are also nearby with great shopping, riverside walks and Muddy fave, the River and Rowing Museum (Henley). Good for: Those who like to eat well-presented and well-executed food in stylish surroundings. Nice enough for special occasions but not too expensive for a meal out when you fancy it. Families are well catered for with a kids menu of chicken stir fry, halloumi bites and fish fingers. There are great walks around here and dogs are welcome in the bar and garden. The staff are friendly and professional and aim to create a community feel. Not for: People wanting a traditional pub where they can down the drinks, play darts and have a sing-song. The Yew Tree has a more restaurant-y feel and is quite genteel. ££: Usual pub food prices with starters around £6, mains from £15, puds at £6.50 and kids meals from £6.50. Still hungry? Take a look at more restaurants in our Fun Finder.